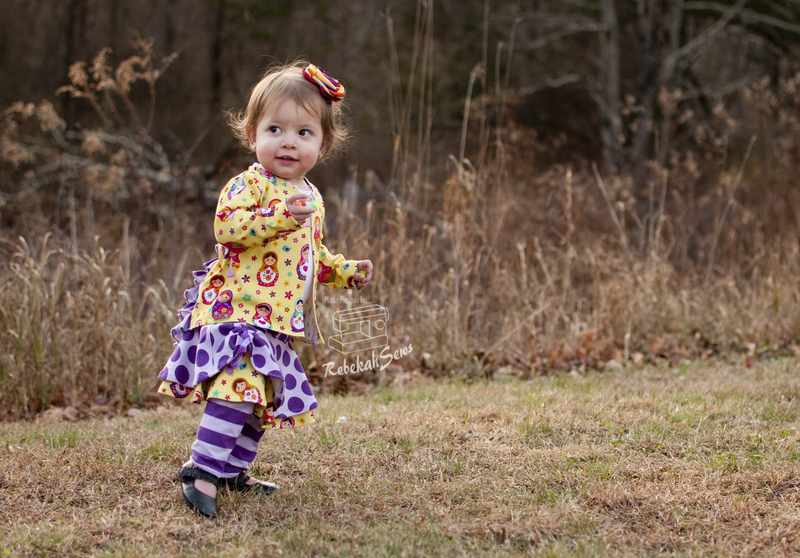 ← Having a Little Superhero Fun with One Thimble! 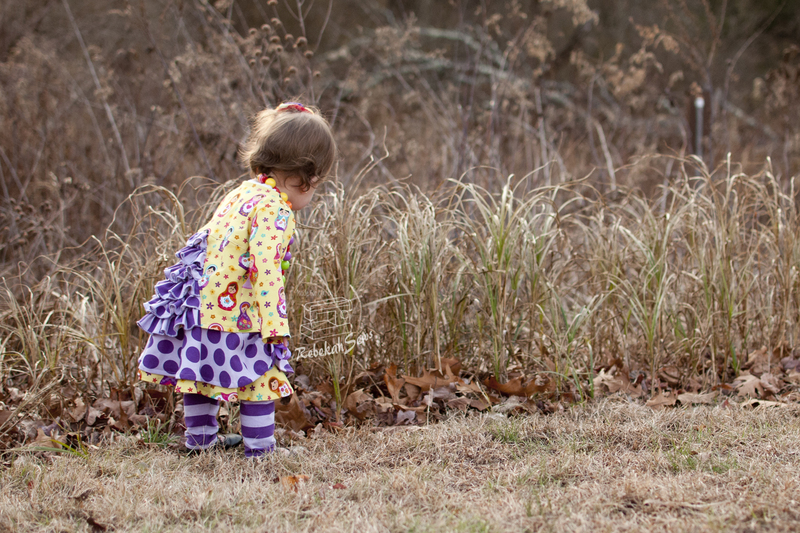 Double Treat with Amazing Fabric and Patterns! 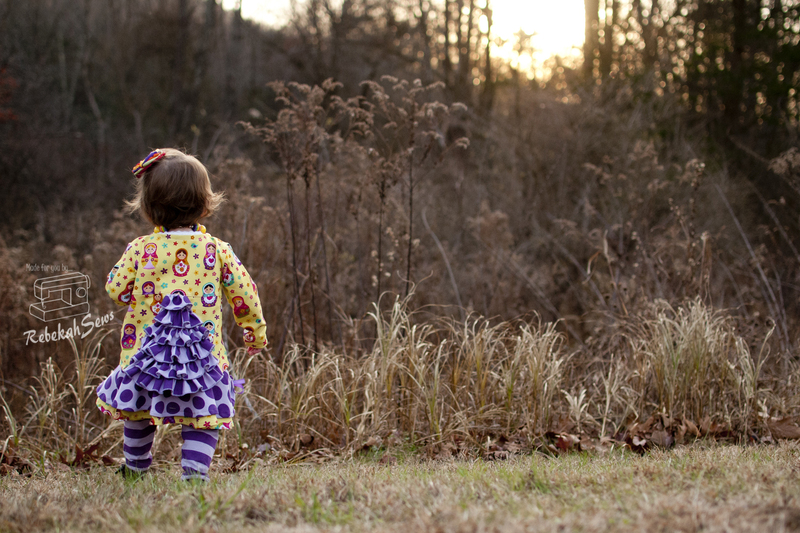 Who doesn’t love yummy fabric and amazing patterns? If you don’t love those then you are reading the wrong blog! If you do, then read on cause I am going to tell you of both! I know two ladies, Trixie of Trixie’s Fabric and April of Dandelions n’ Dungarees, that treated me to what I would say would be the ultimate banana split of the sewing world! Yes, fabric and patterns. Best ever!! First we will start off with the fabric. After all with no fabric, there is no sewing! I have always admired Euro knits however they are a bit more expensive than I am used to. After using them though, they are worth every penny. This was my chance to try one! 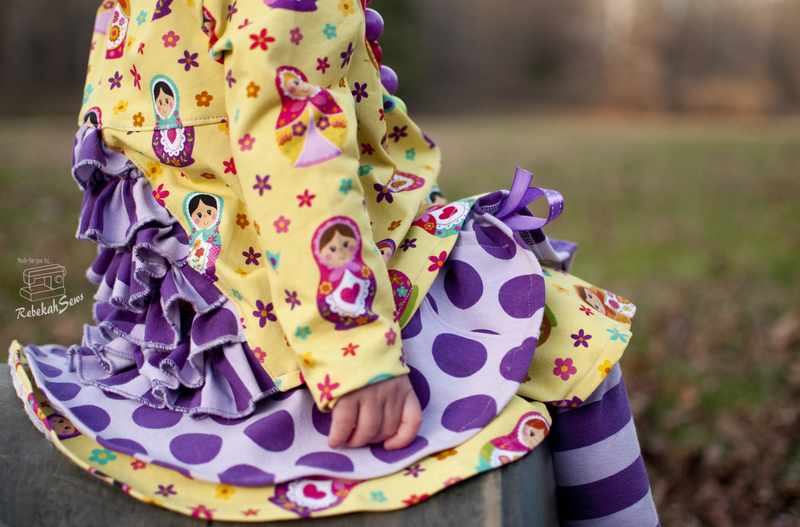 The fabrics I chose were Matryoshka Russian Nesting Doll Organic Euro Knit, and the Purple on Purple Dots and Stripes. These are all cotton lycra with a 4 way stretch. All quality knits and a joy to sew with. Trixie even helped me out with coordinates by taking a photo of the fabrics together to make sure they work together. Made choosing a combo so easy! She also has a Facebook group for specials, pre-orders, and to show off your works of art with Trixie’s Fabrics! Now you ready to hear what I did with those yummy fabrics? I saw these two patterns when she put out the tester call but didn’t have time to test then. So I was very excited when April asked me to review the new Flyaway Ruffle Cardigan and Saucy Skirt. Let’s start with the cardigan shall we? 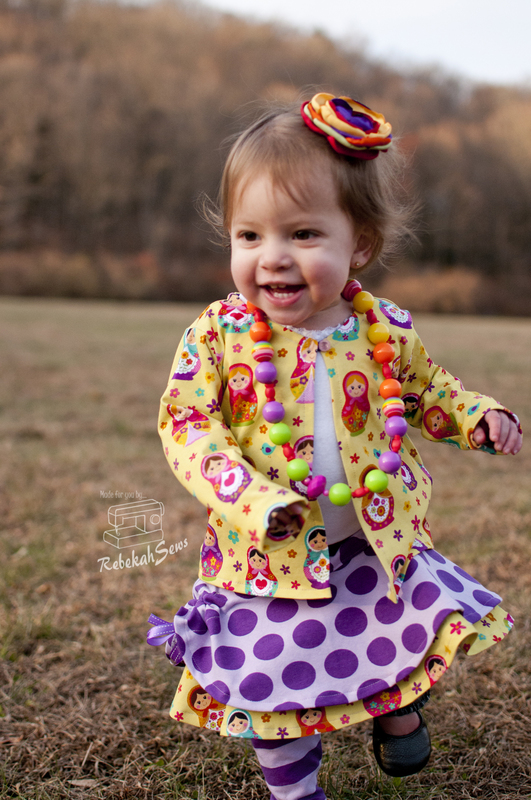 This lovely cardigan is available in baby sizes (NB-24mo), child sizes (2-7), and tween sizes (8-16). 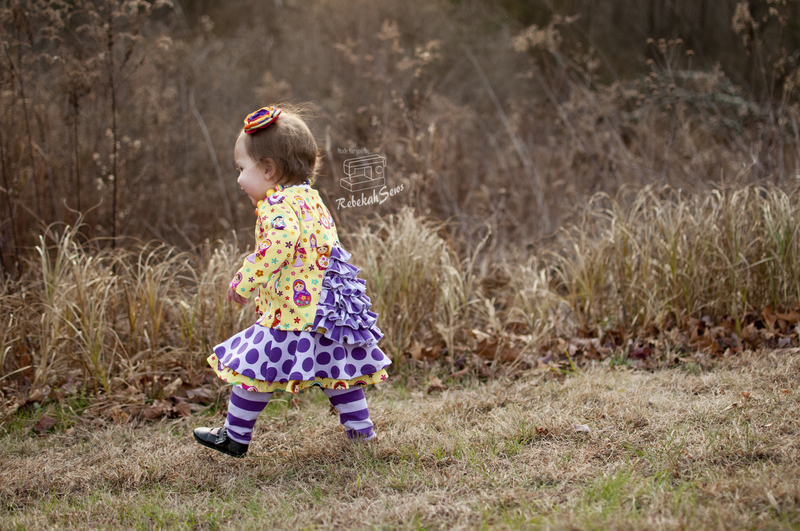 It uses knit fabric to create a fun look with a little ruffle bustle area on the back. There are instructions included on how to make a bow to embellish the back with if you’d like as well. It closes with a button and button loop. No need for a button hole!! While I made mine for everyday wear, there were others who made it out of dressy fabric like lace for a dressy look. This pattern is really fun and versatile! 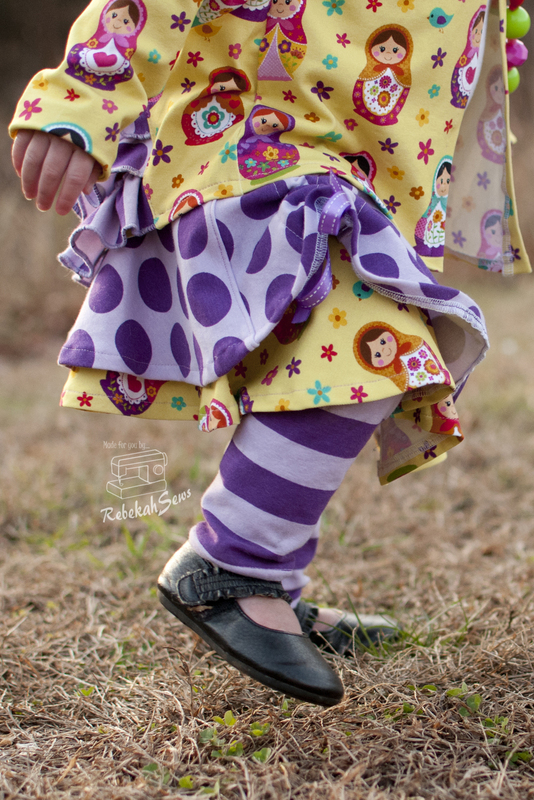 The Saucy Skirt is sure to please any fashion forward little lady and also packs amazing twirl power! 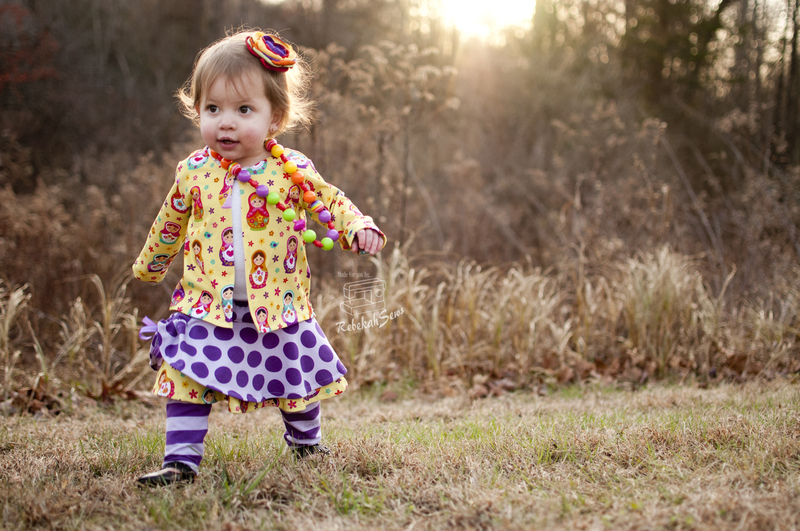 It also comes in baby sizes (NB-24mo), child sizes (2-7), and tween sizes (8-16). This skirt features a drop waist with a single, double, or double with sassy tie options. The skirt portion is a circle skirt which is where it gets its twirl ability! I just love the double skirt with the sassy tie for that peek a boo look. Both these patterns are a ton of fun and I enjoyed sewing these up. I would say these are good for even a beginner that can follow directions well as there are several steps. Because of the amount of steps it is classified as an intermediate pattern. 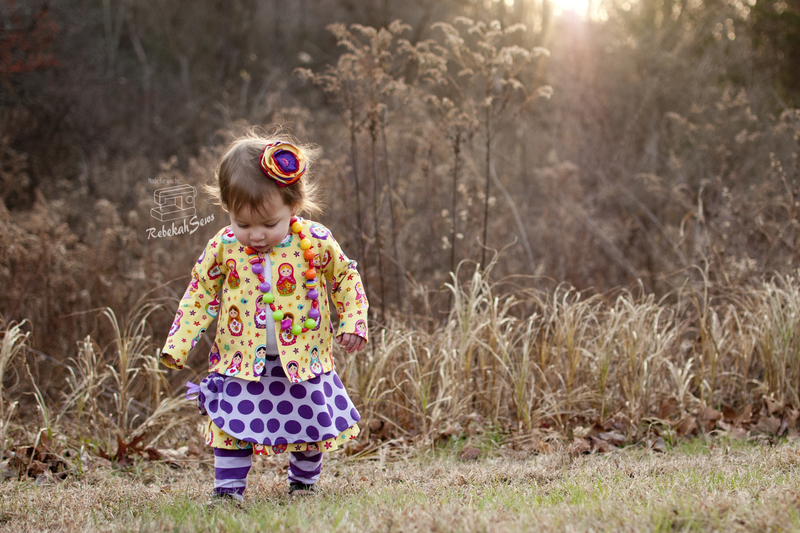 I sewed up the size 12mo and the fit was just what it said it would be. A tad large on my girl as she is between 9 and 12mo sizes right now. I like it a little big though as it will last all season! I had no issues with either pattern. The steps were all clear and the pattern fit together perfect. There was only one thing that I changed and that was the width of the panel for the sassy tie. I found that to be too wide and cut an inch off of it. I would also place it more towards the hem line in order for the bow to be shown off more. That is it! Can’t wait to make more! Wondering about the leggings? 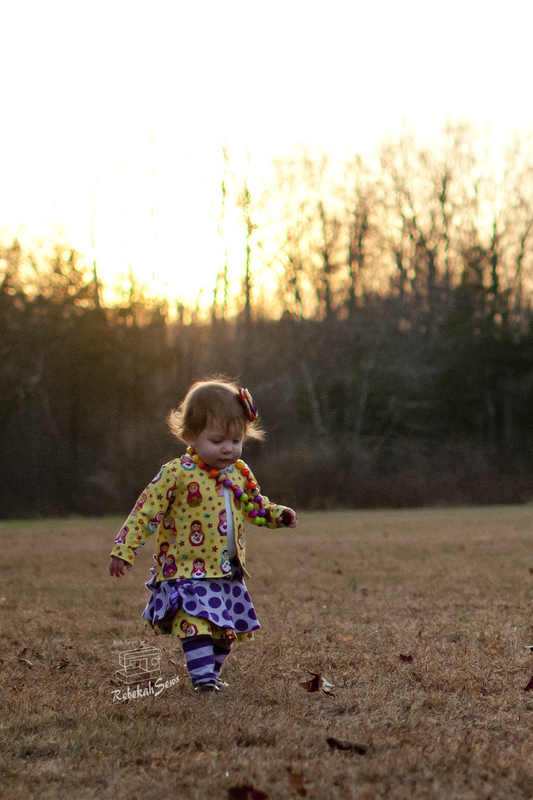 Those are the Jocelyn Leggings by Everything Your Mama Made. They are super easy leggings that come in sizes NB-18 and women’s. I just love the yoga waist which allows for no elastic! So comfy! Ready to do some shopping? You won’t regret any of these purchases. 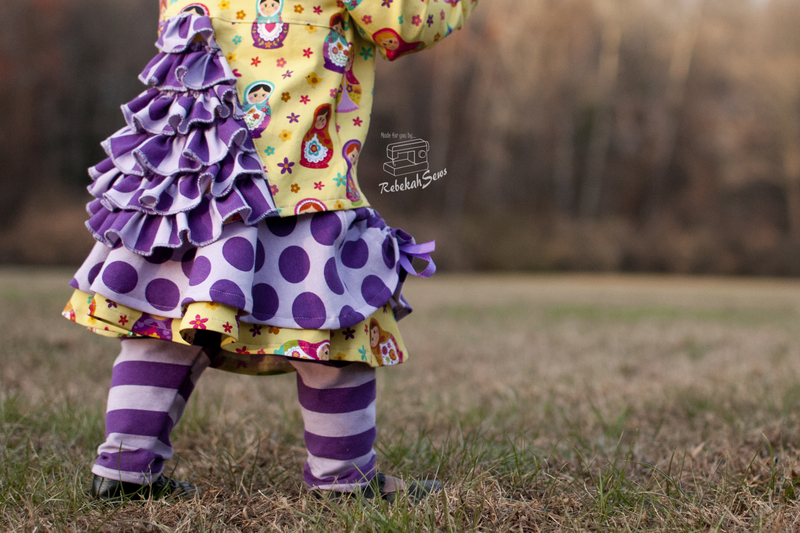 Visit Trixie’s Fabrics on Etsy for more amazing fabrics. Now that you have the fabric you need the patterns! You can get any of the sizes of the Flyaway Cardigan and Saucy Skirt or buy the bundles with all the sizes. Don’t forget the Jocelyn Leggings either. They come in a bundle pack too. Happy sewing! Another win. 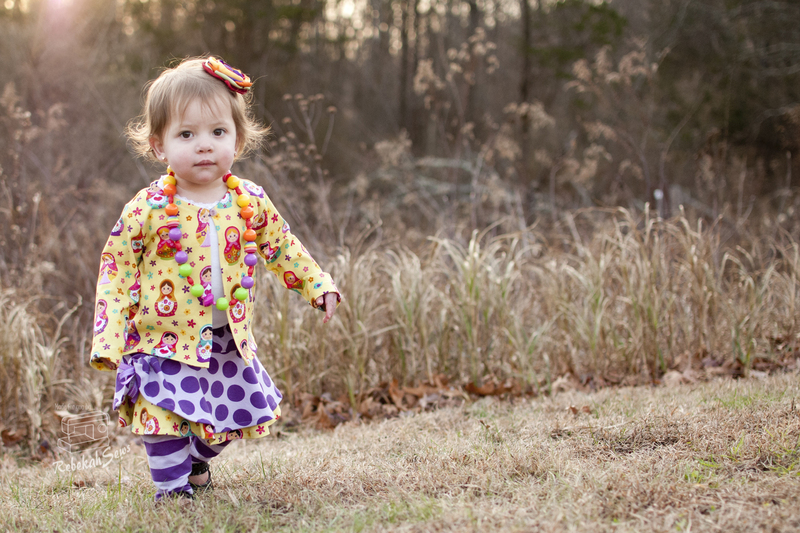 You have the best dressed baby ever!